Povoação is a municipality located in the southeastern corner of the island of São Miguel in the Portuguese archipelago of the Azores. To find photos, more things to do, reviews, and tourist information, use the Povoacao trip planning site . Toronto, Canada to Povoacao is an approximately 11.5-hour flight. The time zone difference when traveling from Toronto to Povoacao is 4 hours. Expect a bit warmer evenings in Povoacao when traveling from Toronto in May, with lows around 17°C. You will leave for Barcelona on the 21st (Mon). Get some cultural insight at El Barri Gòtic and Park Güell. There's much more to do: pause for some photo ops at Casa Batlló, admire the striking features of El Cafè de la Pedrera, tour the pleasant surroundings at La Barceloneta, and take in the architecture and atmosphere at La Sagrada Familia. For more things to do, photos, and tourist information, refer to the Barcelona vacation builder tool . The Route module can help you plan travel from Povoacao to Barcelona. The time zone changes from Azores Time to Central European Time, which is usually a 2 hour difference. In May, plan for daily highs up to 25°C, and evening lows to 17°C. Finish your sightseeing early on the 24th (Thu) so you can take a train to Madrid. Your cultural itinerary includes sights like Museo Nacional del Prado and Museo Nacional Centro de Arte Reina Sofía. And it doesn't end there: contemplate the waterfront views at Retiro Park (Parque del Retiro), admire the striking features of Plaza Mayor, explore the world behind art at Sorolla Museum, and examine the collection at Thyssen-Bornemisza Museum. Discover how to plan a Madrid trip in just a few steps with Inspirock's itinerary builder. Traveling by train from Barcelona to Madrid takes 2.5 hours. Alternatively, you can fly; or drive. Traveling from Barcelona in May, you can expect nighttime temperatures to be little chillier in Madrid, with lows of 13°C. Wrap up your sightseeing on the 27th (Sun) early enough to travel to Lisbon. Start off your visit on the 28th (Mon): steep yourself in history at Castelo de S. Jorge, wander the streets of Alfama, then steep yourself in history at Carmo Convent, then explore the ancient world of Carmo Archaeological Museum, and finally wander the streets of Belém Tower. On your second day here, admire the striking features of Jeronimos Monastery, then admire nature's wide array of creatures at Lisbon Oceanarium, and then see the interesting displays at Museu Nacional do Azulejo. To find maps, traveler tips, and other tourist information, you can read our Lisbon trip builder website . Getting from Madrid to Lisbon by flight takes about 4.5 hours. Other options: drive; or take a bus. You'll gain 1 hour traveling from Madrid to Lisbon due to the time zone difference. In May, plan for daily highs up to 28°C, and evening lows to 15°C. Finish your sightseeing early on the 30th (Wed) to allow enough time to drive to Fatima. Fátima is a civil parish in the municipality of Ourém, in the Portuguese Santarém District. To see ratings, more things to do, reviews, and tourist information, go to the Fatima road trip planning app . Drive from Lisbon to Fatima in 1.5 hours. Alternatively, you can take a bus. Traveling from Lisbon in May, expect nights in Fatima to be about the same, around 13°C, while days are a bit cooler, around 24°C. On the 30th (Wed), you'll travel to Albufeira. Step out of the city life by going to Praia Vale Dos Homens and Praia da Carriagem. Relax by the water at Praia Da Rocha and Praia marinha. Venture out of the city with trips to Praia da Cordoama (in Vila do Bispo), Vale de Covo Beach (in Carvoeiro) and Praia do Amado (in Aljezur). And it doesn't end there: kick back and relax at Falesia Beach, tour the pleasant surroundings at Nossa Senhora da Rocha Beach, and identify plant and animal life at Lagoa dos Salgados. To see reviews, more things to do, traveler tips, and other tourist information, go to the Albufeira vacation planner. Traveling by car from Fatima to Albufeira takes 3.5 hours. Alternatively, you can do a combination of bus and train; or take a bus. 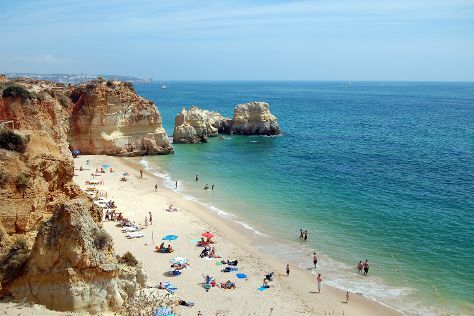 Traveling from Fatima in May, plan for a bit warmer nights in Albufeira, with lows around 18°C. Wrap up your sightseeing on the 5th (Tue) early enough to travel to London. Satisfy your inner culture vulture at Natural History Museum and Westminster Abbey. There's much more to do: explore the world behind art at British Museum, contemplate the long history of Tower of London, take in nature's colorful creations at Buckingham Palace, and get a sense of history and politics at Houses of Parliament. To find reviews, photos, where to stay, and other tourist information, read London travel planner . You can do a combination of bus and flight from Albufeira to London in 6.5 hours. Other options are to do a combination of train and flight; or do a combination of bus, flight, and train. Plan for little chillier temperatures traveling from Albufeira in June, with highs in London at 23°C and lows at 13°C. Cap off your sightseeing on the 8th (Fri) early enough to travel back home.